Welcome back, Punisher fans! The pickings are a bit slim this time around for Punisher stories and news, but we make due with what we got. Introduction – I briefly mention my new job(s), Jake describes how his car is sending him to the poor house, and I try a new beer, and hilarity ensues. I also bore you with a poker story. Jake and I then advise people how to one-star us on iTunes. Contest– Today we announce the winner of our current contest! Brandontheman285, you’ve won some Punisher 2099 artwork! Please send us a line so you can receive your prize! Mail Call – We got a couple of letters for the show today! Arch asks us if Punisher would kill Walter White from the tv series Breaking Bad (great show). Andrew then asks us how we feel about Ennis’s side project Jennifer Blood and how Punisher would work on a team book. Black Stone asks a similar question about Punisher joining the Avengers. Bullet Points -As mentioned before, we cover X-Force #29 and SPACE: Punisher #2. Frank is interesting, but a rather minor presence in the distopian world the story takes place. The other book goes off the rails, and not in a good way. Flashbacks – We wrap up Welcome Back Frank with our thoughts on the Russian and which jokes we thought were the best. As we’ve said before it’s a great “starter” book to people interested in the character. 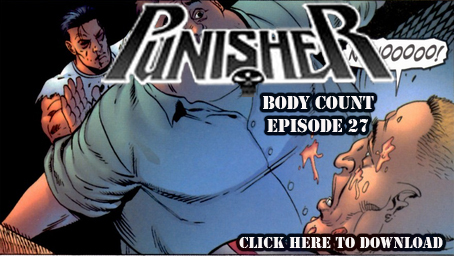 Next episode, we’ll dive back into more classic Punisher. Discharge Papers – A relatively scant segment today! I argue why Deadpool Kills the Marvel Universe just doesn’t work for me and Jake rolls his eyes at yet another Wolverine series, this time taking place in the MAX print.